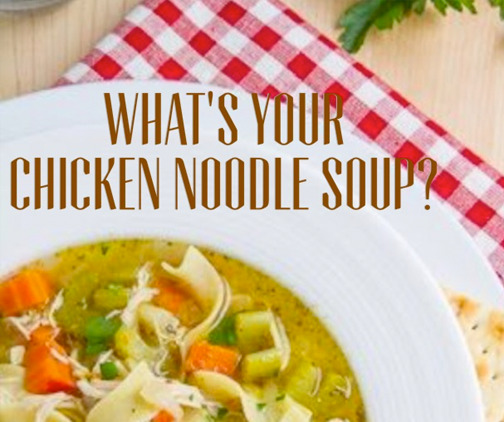 What’s Your Chicken Noodle Soup? I stood in front of the freezer and had another meltdown. The tears streamed down my face as I felt that same punch to the gut nauseas feeling the day mom passed. The last frozen container of my mom’s sauce sat on the bottom shelf next to the ice cube tray, and the darts of regret and guilt started to hit me left and right. When I went away to college, I would come home during the holidays only to find out my mom had been cooking and freezing food for days. I never really appreciated it then. I almost expected that mom would always be cooking because that was something she just loved to do. I never tasted sauce from a jar for decades on end because my mom would boil and stew fresh tomatoes on the stove for hours and then pack them up. Jar sauce was a bad word in our house growing up, and Tupperware was a household name. My mom made the best sauce on Long Island, but she also made the best homemade chicken noodle soup ever. My mom loved to cook, especially for other people. I don’t know if it was the chicken she used or the half of sazon packet she secretly threw in, but her magic ingredient in the soup has scarred me for life. I mean, something was just special in the way she put food together. And when you came to my mom’s house, she always had to feed you whether you were hungry or not. The first words out of my mom’s mouth would be, “Are you hungry?” as she placed your favorite meal in front of you and poured some crystal light pink lemonade in a glass. My mom was a mom’s mom. She knew how to make even a stranger feel comfortable and warm. Her home was your home, and you never left hungry. If she knew you liked a particular food, she would make it. I had a friend whose husband loved eggplant parmesan. He would never admit to his wife or mother-in-law, but secretly said my mom made the best eggplant he’s ever tasted in his life. There was just something about her cooking. Even though it sounds like a cheesy hallmark commercial, she just cooked with so much love. I laugh as I sit back and think how she would even cook for my dogs – her grand-pups. She would pick up the small yorkie and tell me I was working too hard and wasn’t feeding the dogs enough – as she boiled three hot dogs, one for each dog of course. Now, just short four months of mom’s passing, I realize I will never taste her cooking again. “They” say if you have the recipes you can replicate it, but in all reality you can’t. People think just because you have the same ingredients you can duplicate a person’s love. But you can’t. I suddenly realized there would be no more soup, no more sauce, no more eggplant parmesan, no more . . . and then I remembered all those times I didn’t say thank-you mom for cooking for me. Thank you for sacrificing your time and energy for making not only me, but everyone you loved a home cooked meal. The very things we took for granted and at times even threw away, now I would give my right hand for. Why is that? Why does it have to take something so extreme like death to make us appreciate even the very small things in life that people do? So as I sat and allowed the flood gates of guilt to take me down the unpaved road of regrets, my phone went off, and I had a text from my cousin. Not in the mood to be bothered with anything but my pain, I quickly glanced at the message which read, “Hey, I have some extra chicken soup that your mom made. If you want, you can have it.” The sudden joy I felt that ran down my body and comforted me was as if there was a resurrection of my mother through her soup. It was like someone handed me diamonds or gold or billions of dollars. The magnitude of this treasure was even greater. I could smell it. I could taste it. I could even visualize her standing in the kitchen cooking it … and that gave me such comfort. Some would call that fortuitous or serendipitous – but I call that God. Like the song “Come to Jesus” says (by the Brooklyn Tabernacle Choir): “Search no more, there is an answer, In this world of doubt and fear, He has come to lift your burdens, You will find your comfort here … Come to Jesus just as you are, Broken and scarred, come to Him. Love and mercy, for every broken heart, He is waiting with open arms, For the pain, that’s left you broken, He will give you peace today, Every tear, you’ve cried in sorrow, He will wipe them all away … ” Who would have thought the prospects of having just one more cup of my mom’s chicken noodle soup would bring me such joy. The pain of grieving is very real and anyone who tells you otherwise is not being truthful. But there do come days and moments in time along the journey of grief that a glimpse of happiness seeps in and allows you to bounce out of the pangs of sorrow into a fond loving, happy memory. Remember this, our moms wouldn’t want us to remember them with deep sorrow and constant pain. They wouldn’t want us to continuously torment ourselves with what the great accuser of our souls does – to use our deeds or lack of deeds, words or lack or words – to prosecute us. Without a doubt, my mom is sitting in her mansion in heaven, cooking up a storm for Jesus and the millions of angels that surround the throne of God, if they are able to eat … And if they can’t, she’s doing something that brings her peace and joy to God’s kingdom, because that’s who she was. A woman of God who had a servant’s heart. And through the tears, that brings a smile to my face. Like the song by Casting Crowns says, “I can only imagine – what it would be like – when I walk by your side … ” What this memory did for me was bring me back to the remembrance that God has given us all a special gift, an anointing that makes each of us special. 1 Peter 4:10 says, “As each has received a gift, use it to serve one another, as good steward of God’s varied grace,” and Romans 12:6 says, “Having gifts that differ according to the grace given to us, let us use them …” My mom was blessed because she knew what her gifts were and she wasn’t selfish with them. She loved using her gift to bless others. That is what I seek to emulate from her. Through the memory of my mom’s cooking, God gave me comfort. I’m so thankful. I guard my last Tupperware of chicken noodle soup in the freezer and find comfort every time I open the door and see it, knowing God blessed me with a mom who blessed His kingdom with her gifts. Take a moment, find your frozen chicken noodle soup, and allow yourself a minute of reprieve with a happy memory.